Just as one can count on Yamaha to continually revise and develop their core range of synthesizers and keyboard workstations, it's also no surprise to see the company repackaging their existing technology in the guise of a serious master keyboard. 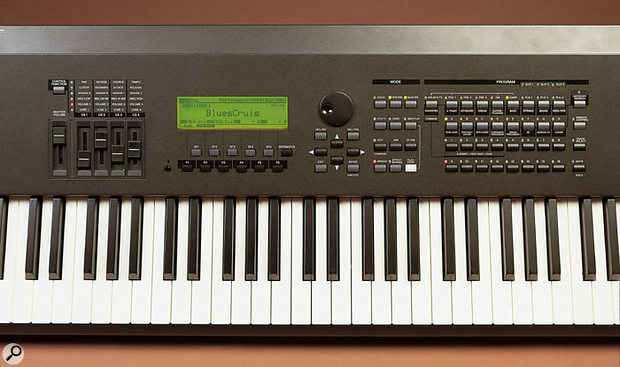 Such was the case with the S80 (reviewed in SOS February 2000), which added a sober black casing, wood-effect end cheeks and an 88-note, weighted piano-action keyboard to a synth engine that was essentially a CS6X with additional piano and keyboard waveforms and voices, plus master-keyboard functions. Jump forward to December 2002, and SOS reviewed the S08, which amounted to a cut-down S80. 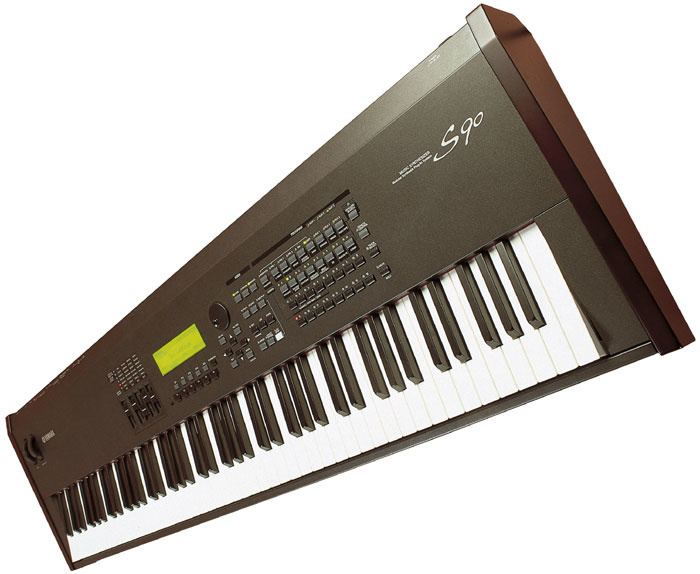 And here we are in December 2003, looking at the 64-voice polyphonic S90, which offers similar master-keyboard facilities to the S80, borrows sounds from the Motif range of synths, and adds a brand-new, three-layer stereo piano sample set, plus a variety of acoustic and electric keyboard samples. There is an 88-note instrument in the Motif range — the Motif 8 — and the S90 offers that instrument's Balanced Hammer Effect keyboard (itself based on the action supplied with Yamaha's dedicated digital pianos), but loses the Motif's sequencing and sampling functions. It does, however, retain the Motif's arpeggiator — more of a phrase generator than anything — and grows a number of new Voices and Performances based on the new waveforms. Physically, the S90 is large, though not much larger than such a substantial keyboard action would warrant, and rather heavy, at 23kg. It's supplied with plenty of buttons and sliders, which enable the synth's operating system to be comprehensively accessed in conjunction with the large (240 x 64-dot) LCD. Rear-panel connectivity is a high point: the main stereo audio out is joined by a pair of assignable outputs and the headphone socket (why do few manufacturers apart from Korg appear to put headphone sockets on the front of their instruments? ), four footswitch sockets and breath controller input, an audio input, MIDI In/Out/Thru connections, and a USB port, for linking to a Mac or PC. 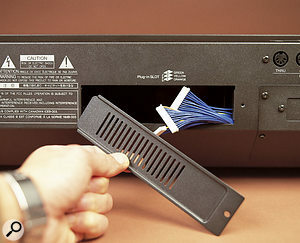 A blanking panel can also be removed to allow an mLAN high-speed audio and MIDI interface card to be installed. While currently a little expensive, this option is now more of a going concern since more third parties, and Yamaha themselves, are finally supporting the protocol with compatible products. 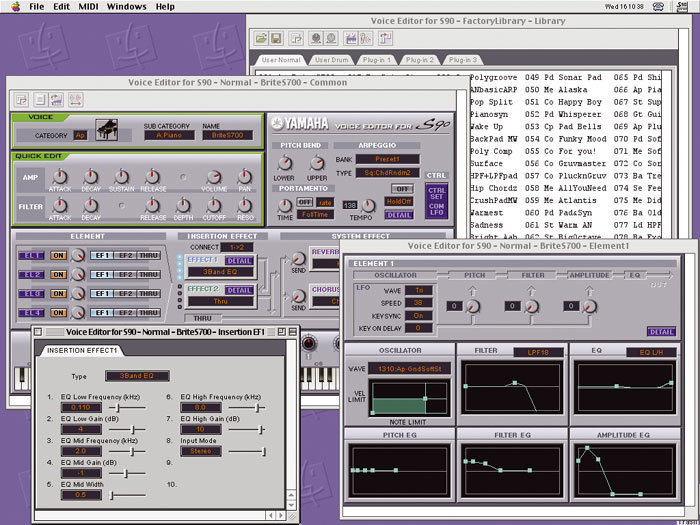 The S90's synth sound engine is based on Yamaha's S&S (sample and synthesis) standard, AWM2. 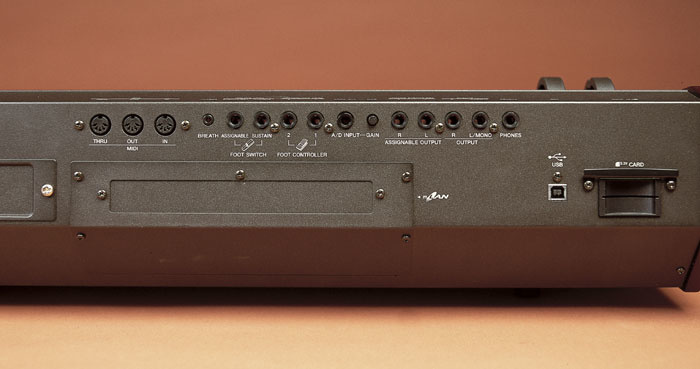 Although basic waveforms are always being modified or improved and effects complements tinkered with, Yamaha's synth voice-generation system has tended to remain similar of late. That means that the basic architecture of the S90 is essentially that of the original Motif family (not the new Motif ES range, which is due any day now). The waveform collection on the S90 is identical (bar some extra acoustic and electric keyboard waves, of which more in a moment), and the factory voices are also similar, although again with new Voices and Performances taking advantage of the uprated data. The S90 is structured in the usual hierarchical fashion. Synthesis starts with an Element, which contains all the basics for electronic sound production: an oscillator with one of 1347 sampled waveforms at its heart, tuning and pitch-envelope parameters, a resonant filter (available in no fewer than 21 types) with filter envelope, level and pan controls, and an amplitude EG and LFO that can be routed to the pitch envelope, filter envelope and amplitude envelope. Up to four Elements make up an S90 Voice, and those Elements can be given their own key and velocity ranges, making for a mini 'Performance'. However, if you use more than one Element in a Voice, the total polyphony drops accordingly. In addition to standard Voices, there are Drum Voices, which are broadly similar in synthesis features, though a different waveform/synthesis pairing can be set for every key of the S90's 88-note range. In practice, the synthesis features are a little simpler, but filtering, pitch, tuning, the LFO and so on are all available. Next, we have the Performance, whereby up to four Voices are layered, with or without velocity switching, and/or split across the keyboard. Performance creation is related somewhat to the S90's master-keyboard functions, which I'll address in a moment. Offsets can also be applied to significant synth parameters for Voices within a Performance (envelopes and filter response, for example), so you don't have to keep creating new Voices every time you'd like a Performance part to be just a little different. This standard structure becomes a little more complicated if you install one or more of Yamaha's optional PLG synth boards — the S90 can accommodate three — but only in that you'll have to become used to a given board's synth-editing system, and that an S90 Performance can include one Voice from each of up to three boards in addition to the four Voices sourced onboard (there's more on the PLG boards in the box above). The S90 is generously provisioned with factory settings; 384 Preset Voices and 48 Drum Kits, 128 General MIDI Voices and one GM drum kit, and for the user, 128 Voice and 16 Drum Kit memories (the latter are filled with factory settings when you take delivery of the S90, but can be overwritten at any time). Factory preset Voices are sensibly assigned to different categories on the S90 (for example 'Acoustic Piano', 'Keyboard', 'Synth Lead', 'Drum/Percussion' and so on), and this is a habit you should consider forming as you program your own Voices. The S90 has a sophisticated search facility that lumps similar Voices together, and clearly labelled buttons allow you to access and audition related Voices via the display. Finally, there are 128 factory Performance memories, but these too can be overwritten by the user. More memories, preset and user, become available if you install PLG boards. The PLG150DR: a stereo drum board. The PLG150AN: an analogue-modelling board. The PLG150PF: a 64-voice polyphonic piano board. The PLG100XG: a 16-part multitimbral XG (extended General MIDI) board. The PLG150PC: a Latin percussion board. The PLG150DX: a six-operator FM synthesis board. The PLG150VL: an acoustic-modelling board. The PLG100VH: a three-part vocal harmony board. This isn't a synth as such, but can be used with a vocalist singing into a mic plugged into the S90's audio input for real-time harmony generation. The sound set of the S90 is essentially that of an original Motif, although over 30MB of extra wave ROM is given over to new acoustic and electric piano waveforms. Consequently, the factory sound set is slightly different to allow for the many piano and keyboard sounds. Yamaha have made a big deal out of the new stereo piano samples supplied with the S90. On first examination, the deal is worth making: the pianos have presence and a lively feel, and play well from the keyboard. The samples are also free from annoying artefacts such as buzzy loops. On closer examination, however, the situation is less clear-cut. There don't appear to be enough multisamples for a start, and so an artificial edge appears where some samples have been keygrouped a bit further than they should. I occasionally found some of the solo preset piano Voices to be a bit plummy, but tweaking edit settings did help here; in any case, not all suffer from this problem. The three-layer split of the first piano in the set — 'A01 3LayerS700' — is also a little disappointing: there is too much timbral contrast between layers, especially the low- and mid-velocity layers. This contrast makes it very difficult to play a convincing crescendo or decrescendo, as the timbral change at the crossover point spoils the effect. So I wouldn't stick my neck out with the S90 on a solo classical gig. But in a pop (or even ensemble jazz) context, the piano is genuine and convincing, sitting nicely in a mix, and adding quite a sophisticated sheen, particularly to pop arrangements. I have fewer reservations about the electric piano sounds: Yamaha usually get these right, and the S90 is no exception. Across the board, they're wonderful to play, especially with this excellent keyboard. I liked the Motif's sound set, so it's no surprise that I found the remaining S90 sounds to be well up to Yamaha's high standard. The drums, basses, pads, and synth recreations are all worthy of praise. What's more, if you crank up the volume, you'll notice the S90's really chunky bottom end, which bodes well for dance and electronica work — although that might seem strange considering the sober exterior of this particular instrument. And how do effects fit into this equation? Again, these are largely the same as those on the original Motif. First of all, there are the Reverb and Chorus send effects, available in all modes. Reverb offers 12 types, including all manner of rooms and halls, plus 'Basement', 'Plate' and 'Canyon' amongst others. Chorus offers 25 effects, with the usual suspects (chorus, flange, and phasing) joined by a number of straight (and not so straight) delay effects. In Performance and sequencer-playback mode (of which more in a moment), a third send effect, Variation, is added; the options here number 25, ranging from more chorus, flanging and phasing effects to distortion, auto-pan, amp simulation, compression, EQs and enhancers. In addition, there are two insert effects that can be freely assigned in parallel or serially to one or more Elements within a Voice. One insert duplicates the 25 effects offered by the Variation effect, whilst the other offers 104 effects that really do cover all the bases, including off-the-wall treatments such as 'Digital Turntable', 'Attack Lo-Fi', 'Low Resolution', 'Digital Scratch', and 'Talking Modulator'. Lastly, there's a five-band Master EQ section across the S90's main output. It's a bit of a surprise to see the Motif's arpeggiator making the crossing to the S90, though the surprise is entirely pleasant! I like arpeggiators, and this one is about as good as they get. In fact, it's so sophisticated that it moves rather too far from classic arpeggiation to 'instant-gratification' auto-accompaniment. Still, everything has its place. There are 256 preset arpeggio patterns, and the standard broken-chord patterns are joined by a huge number of what can only be dubbed phrases. These suit different musical styles and instrument types, so you have trills, flute flutters, guitar picking and strums, dance bass grooves and drum patterns. There is unfortunately no way of creating your own arpeggiation patterns, although those created on the Motif can apparently be imported into the S90 if they've been saved to a Smart Media card first. But the response of the arpeggiation can be tweaked a little. It can be restricted to a given note or velocity range, for example, and the velocity response and gate time can be altered. A global tempo can also be set, and the arpeggiator can, of course, be sync'ed to incoming MIDI Clock. In Performance mode, the arpeggiator can be switched in or out for each part, but it's not possible to have a different pattern for each part. Sadly, notes generated by arpeggiations aren't output over MIDI from the S90, as was the case with the Motif. The S90 lacks a fully featured sequencer, and thus lacks what might be dubbed a 'Song' mode on a workstation synth. It does, as previously noted, offer a playback sequencer, and it's in this mode that you find the instrument's multitimbral setup. And it's here that you also play the S90 multitimbrally from an external sequencer. A button labelled 'Seq Play' takes you into the sequencer-playback mode, which is where you can load and play MIDI files from Smart Media cards located in the S90's rear-panel card slot. Function key 6 in this window is labelled 'Mix' and accesses a pretty fully featured set of mixer pages. On the basic S90 (ie. one not yet expanded with PLG cards), this equates to 16 channels of level and pan controls on one window. You can navigate to the channels via the S90's standard Edit arrows, or via the lower two rows of buttons labelled 1-16 to the right of the front panel (these buttons double as solo/mute functions). Other sub-windows of the Mix page allow you to tweak the sends to the reverb, chorus and variation effects, set up the audio input, and select Voices for each part to play. The S90's Category search facility can also be used here. Initially, it appears that there are no memories for Seq Play Mix setups, but closer examination reveals a Template window. Here, not only can you select from a handful of factory mix templates aimed at various musical styles, but you can save your own Templates (which consist of Voice assignments, levels, effects settings and so on) for recall at a later time. There are 50 locations, and all can be named and overwritten by the user. Usefully, it's also possible to quickly send all the settings of a Template as a bulk dump to an external sequencer, so that they can be recorded at the beginning of a MIDI file for instant reconfiguration of the S90 whenever that Song is selected. When using the playback-sequencer function, it's possible to create chains of MIDI Files from an inserted Smart Media card, and transmit individual sequence tracks to external MIDI devices via the S90's MIDI Out. MIDI Files are beamed to a Smart Media card installed in the S90 via a piece of bundled software (File Utility, which works on both Macs and PCs). In addition, your custom Voices and Performances can be saved to Smart Media card without you having to bother with the computer. If I have one niggle with the S90's multitimbral setup, it's that busy sequences heavy in controller data can cause the sequencer to 'choke' and slow down. Pressing some front-panel buttons during playback — such as you might to search for new Voices in the Mix Template — can also cause small hiccups during a busy performance. More normal sequences, with a bit of restraint on the controller front, work flawlessly. Photo: Mark Ewing Yamaha are nothing if not generous with the freebies they supply with their instruments these days, and the S90 is no exception. Central to the suite of software bundled with this instrument is the Voice Editor for S90 application (shown right), for both Mac and Windows, which provides detailed and graphical access to all Voice parameters, plus easy computer-based offlining of banks of your custom Voices. The only thing you can really moan about is that you can only load up the Voices from the User bank, and that it's not possible to edit Performances. File Utility is also cross-platform, allowing files to be sent to and extracted from a Smart Media card slotted in the S90. USB drivers for both platforms are also supplied, as are setup files that allow various mix parameters and transports of some popular MIDI sequencers, such as Cubase, Logic and Sonar, to be controlled from the S90. There is more for PC users, though: they gain SQ01, a full sequencing software package, and the matching Auto Arranger utility that works in tandem with SQ01. Note that there is nothing specifically for Mac OS X yet, though a Mac OS X driver is available at www.yamahasynth.com. Finally, an additional CD provides demo songs of, and editors for, Yamaha's family of PLG boards. Quite independently of its synthesis facilities and effects, a lot of people will be looking at an instrument like the S90 just for the quality of its keyboard and the potential offered by its control set and master-keyboard functions. First of all, I'll just say that I found playing the keyboard a pleasure. It's perhaps a little lighter than the real thing, but allows you to access the maximum expressiveness from the new piano sample set. It's not quite the same as a real piano feel, but it's close, and provides a good halfway-house for someone who spends most of their time working with lightweight, plasticky synth keyboards. Personally, I do find there's an adjustment period, but my fingers don't get as tired on the S90 keyboard as they do on a real piano, and they become used to the action much more quickly. The keyboard is great for playing all manner of piano Voices, but it can be a slightly disconcerting experience to play more straight-ahead synth Voices and trigger drum sounds from such a substantial keyboard — as it is with any weighted keyboard of this type. As a source of real-time control, the S90 scores well, starting with velocity and aftertouch sensitivity, pitch-bend and mod wheels (which are located in a slightly odd but still accessible area of the front panel), a pair each of footswitch and footpedal sockets, breath-controller input, and four control sliders. The latter can address up to 20 parameters between them, courtesy of a handy 'Control Function' button. Beyond this, the S90 functions as a four-zone master keyboard, capable of addressing onboard Voices or sounds from external instruments, depending on what you wish to achieve. Up to four zones can be layered, velocity-crossfaded and/or split across the keyboard, on different MIDI channels when routed outside the synth. There are 128 memories in which to save master-keyboard setups, though a Master Mode memory could be something as simple as just one Voice assigned to the whole keyboard. Used in this way, you can create your own little sub-set of the onboard Voice library for even easier access than when using the Category search option. One small point: a lot of synths and keyboards that I play 'auto-sense' the polarity of the footswitch being used for sustain-pedal functions, or have a 'utility' menu item that lets you choose one or the other. Not the S90. The footswitch I had to hand needed a quick solder job to function with this synth! And while I'm at it, the manual also has to be the subject of some criticism. It appears to be trying very hard to be clear and well-organised, but it fails. In a manual of over 130 pages, 32 pages are given over to a Basic Section, and another 60 or so are gathered together as a Quick Guide! The index isn't all it could be, and all I can say in its favour is that the Reference/Function List section centralises all important facts and features, though this still isn't perfect. Overall, the S90 is a great instrument — fabulous to play, producing a great sound that could stand its own in almost any musical setting from club muso on stage to dance jockey in search of something a bit more ambitious. It'll also impress clients in any studio setting. I would have preferred to be more bowled over by the new piano samples, but you can't have everything. And in any case, they may suit you down to the ground — they certainly work in many contexts, just not a solo classical recital! The effects complement seems a little stingy compared with what's usual these days, but the quality is very good. Apart from small niggles like the manual, it's hard to be negative about the S90. Overall, the synth offers good value for money, and is expandable (with PLG cards and the mLAN board). The Smart Media slot also makes it a doddle to move data around and access MIDI Files. My feeling is that it would sit well at the centre of a stage or studio rig, and offers a level of playability that's unreachable with a plastic synth keyboard. Smart Media card data storage. Sequencer struggles when presented with controller-heavy data. The S90 is a good all-rounder and should suit discerning studio musicians as much as on-stage performers who require a little bit more from their main keyboard. It looks like good value, too, packing a lot of synth into a solid and serious package. Yamaha-Kemble Brochure Line +44 (0)1908 369269.